Large cities are known by their landmarks, for example, Chicago: the John Hancock building, or the Willis Tower (formally known as the Sears Tower). Paris: the Eiffel Tower, London: Big Ben, New York: the Statue of Liberty, etc. When it comes to the beautiful city of Toronto, the ultimate landmark is the CN Tower, soaring at a height of 553.33 m (1,815 ft, 5 inches). It is located in the heart of Downtown between the Rogers Centre (formally known as the Sky Dome) and the Metro Toronto Convention Centre on Front Street. The CN Tower draws in more than two million international visitors annually, many of which prefer to stay in Toronto furnished condos. The building elevates to various levels, each featuring a different focal point. The breathtaking view at the Look Out Level, at a height of 346m (1,136’) is a perfect place to take pictures. Snapshots on the Glass Floor, up 113 storeys at 342m (1,122ft) will definitely find a place in the family photo album as well. The Sky Pod at the 447 metre (1465 ft.) level contributes a clear 360 degree view of Toronto, Lake Ontario, and close districts. The charm of the famous Toronto landmark doesn’t stop on these levels of the CN Tower. There are plenty of stores, cafes, bars and restaurants scattered inside the building as well. The CN Tower is open 364 days a year (closed on Christmas Day). Hours of Operation are adjusted seasonally. To confirm the hours for the date of you wish to visit the CN Tower, please call: (416) 86-TOWER. 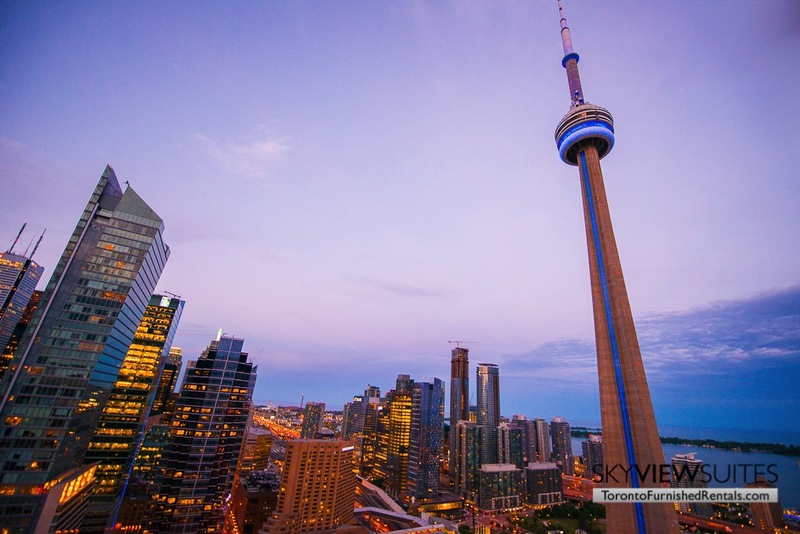 For Toronto accommodations, or to find furnished apartments for rent in Toronto, contact us at: 1-888-SVS-STAY (787-7829).